An analysis of 190 pedigrees with Trisomy 21 suggests a cytoplasmic predisposition for the inheritance of Down syndrome and an association with other aneuploidies, non-chromosomal syndromes, autoimmune, neurodegenerative and oncological diseases.The extra chromosome seems to be responsible for the increase in free-radical intensity and the decrease of SOD-1 activity with age. The disturbance of the oxidant-antioxidant system could be the direct cause of this chromosomal nondisjunction. These data as well as the predominant maternal origin of the extra chromosome and the age-dependent incidence was the basis for the mtDNA sequencing in a donor of extra chromosome 21. Three new point, non-polymorphic mutations, not described before, were found in the following genes:- ATP-ase, G8764A and ND-5 G13243A with the same amino-acid substitutions Ala/Thr and in ND-1 G3337A-Val/Met. The mtDNA mutations detected in cases of Alzheimer's disease, insulin-independent diabetes, some cancers, and in somatically healthy people of 40 years and older could explain the connection of Down syndrome with these diseases and aging. Moreover, mtDNA analysis in patients with trisomy 21 might help to elucidate the nature of free-radical damage. This phenomenon is directly related to the manifestation of the syndrome and cannot be explained solely by the secondary SOD-1 gene dosage effect. 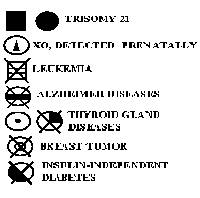 Down syndrome (Trisomy 21) is the most frequent chromosomal pathology found in live-born children. In spite of numerous studies on this subject the mechanisms of aneuploidy induction remain unclear, as well as the reasons for the predominant maternal origin of the extra chromosome 21. Many well-known and often described facts also need explanation. The occurrence of several cases of Trisomy 21 in the same family and pedigrees of Down syndrome with other chromosomal and non-chromosomal pathologies needs explanation as does the rigid age-dependent incidence of Down syndrome. 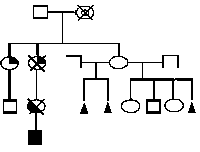 The following types of pathology was found in 15% of the siblings of the families examined: heart defects in 3.7%, neural tube defects in 3.2%, brain tumours, leukemia, retinoblastoma, insulin independent diabetes, cleft palate and lip, and mental retardation were detected in 0.5-1.0%. Repeated cases of Trisomy 21 were present in two families (1.0%) who had more than one person with Down syndrome. In another family the XO Karyotype was detected prenatally. Oncological disorders were found in 5.8% of the mothers, insulin-independent diabetes in 3.2% and thyroid gland diseases in 7.9%. Disruption of reproductive function was the most frequent pathology; spontaneous abortions in 31.1% and infertility of various types in 12.1%. The above mentioned disorders were found in relatives of mothers, including cases of Trisomy 21 (3.7%) and Alzheimer's disease (1.6%). These pathologies were much less frequent in the father's pedigrees. 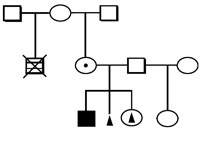 Analysis of the 190 pedigrees, including 32 with multiple marriages of mothers and/or grandmothers, suggests a cytoplasmic inheritance of the predisposition to Trisomy 21 (Figure 1). Examination of the extra chromosome 21 donors (Arbuzova, 1996a) showed an increase of free-radical processes in blood as measured by chemiluminescence (Imax), and a decrease of SOD-1 activity (Table 1). Analysis of the age-dependent changes of these parameters shows that the increase of free-radical activity with age is also observed in control groups but is less significant than in donors of extra chromosome 21 and is accompanied by an increase in SOD-1 activity (Arbuzova, 1996b). The tendency towards a decrease in SOD-1 activity in the control group is only noticed in women older than 40 years (Figure 2). Various degree of oxidant-antioxidant system disturbance in donors of the extra chromosome was observed, irrespective of age, but the highest increase of free-radical activity and the lowest decrease of SOD-1 activity was found in older age groups (Figure 2). Increased free-radical activity could be the direct cause of chromosomal nondisjunction. It is well known that the action of free radicals during cell division can damage DNA molecules, decrease the conformative mobility of supermolecular complexes in nucleo-lipoproteins, affect adhesion of chromosomes, and affect centromeres and the spindle (Halliwell & Gutteridge, 1985; Lee, 1963). Any of these events occurring during mitosis or meiosis impedes division and could cause cell death, chromosome aberrations and nondisjunction. Cytogenetic changes in the donors of the extra chromosome have been described many times. The changes found, such as somatic deletions and translocations, pericentric inversions and aneuploidic cells is similar to the effect of irradiation (Uchida and Freeman, 1986; Lloyd et al., 1980; Uchida et al., 1975). We found a positive correlation between chromosomal aberrations in extra chromosome donors and the level of oxidant-antioxidant system disturbance (Arbuzova, 1996a). Changes in the mosaic clone of cells with an extra chromosome 21 (Uchida & Freeman, 1985) have been described. According to our data 57% of donors of the extra chromosome had aneuploidic cells (2-4%) mainly with extra chromosomes 21 and XXXX or X0, often in combination with premature disjunction of centromeres (Arbuzova, 1996a). In vitro studies of radiation-inducted mitotic chromosome nondisjunction of human lymphocytes have shown a significantly increased susceptibility of chromosomes 21 and X to abnormal segregation (Uchida et al., 1975). We suggest that increased free-radical intensity is a cause of cells with an extra chromosome 21 as well as other chromosome aberrations. Our data on the cytoplasmic inheritance of a predisposition to Trisomy 21 and biochemical changes in the donors of an extra chromosome as well as the well-known predominant maternal origin of extra chromosome 21 and the age-dependent frequency suggests that the mitochondrial genome is probably involved in the pathogenesis of Trisomy 21 (Arbuzova, 1995). 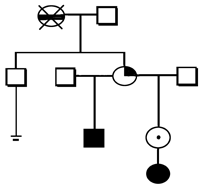 Full mtDNA sequencing was performed in a donor of an extra chromosome 21. Three new point, non-polymorphic mutations, not described before, were found in the ATPase G8764A and ND-5 G13243A genes with the same substitutions of alanine by tryptophane and in gene ND-1 G3337A with the exchange of valine by methionine. In our opinion the mtDNA mutations in cases of Alzheimer's diseases, insulin independent diabetes, some cancers, in somatically healthy people of 40 years and older (Shapira and Cooper, 1992; Richter, 1992; Shoffner and Wallace, 1992) might explain the connection of Down syndrome with these diseases and with aging. The damage caused by free radicals and by radiation, is determined by the dose and duration. Depending on dose and time, pathological changes of varying degrees may or may not appear due to the compensatory responses of the antioxidant system. These factors could explain the controversial results of radiation on the frequency of Down syndrome (Strigini et al., 1990). At the same time there are some convincing data about the effect of radiation on the increase of Down syndrome, especially in older age groups. These environmental factors may be independent, or they may be additive (Uchida, 1981; Sperling et al., 1991). We propose the following scheme of pathogenic links of the vicious circle of mutations, free radical damage and aneuploidy. Is the free-radical damage the result of a secondary SOD 1or 2 gene dosage effect? It is difficult to agree with the view that free-radical damage in persons with trisomy 21 can be explained only by the secondary SOD-1 gene dosage effect (Groner et al., 1994). First, taking into account SOD-1 biochemical properties (Fridovich, 1986) the increase in activity of this enzyme by a factor of 1.5, should not lead to such consequences. Moreover, our investigation of SOD-1 activity in people with Trisomy 21 from 1 month old to 45 years of age (Arbuzova, 1996a) demonstrated a decrease in enzyme activity with age (Figure 3). Figure 3. Age dependent change of SOD-1 activity in persons with Trisomy 21 and control group. Second, if in new-borns with Trisomy 21, the level of free radicals is initially raised, the increase of glutathione peroxidase activity (Sinet et al., 1975) becomes clearer. Therefore, our main conclusion is that it is necessary to continue investigating the role of the mitochondrial genome in the aetiology and pathogenesis of Trisomy 21. We thank very much German colleagues from Gottingen University, Neuropediatric Department (Prof. F.Hanefeld and Dr.E.Wilichowski) for the assistance in fulfilling the mtDNA sequencing. Arbuzova, S.B. (1995). About the role of the mitochondrial DNA in the origin of the regular trisomy 21. Cytology & Genetics, 29, 3, 77-80 (in Russian). Arbuzova, S.B. (1996a). Free radicals in origin and clinical manifestation of Down's syndrome. Cytology & Genetics, 30, 2, 25-34 (in Russian). Arbuzova, S.B. (1996b). Age-dependent Down's syndrome frequency and free-radical theory of aging, Cytology & Genetics, 30, 5, 26-34 (in Russian). Groner, Y., Elroy-Stein, O., Avraham, K.B., Schickler, M., Knobler, H.D., Minc-Golomb, D., Bar-Peled, O., Yarom, R., Rotshenker, S. (1994). Cell damage by excess CuZnSOD and Down's Syndrome, Biomedicine & Pharmacother, 48, 231-240. Fridovich, I. (1986). Superoxide Dismutases, In A. Meister (Ed. ), Advances in Enzymology and Related Areas of Molecular Biology, pp.61-97. New-York: John Wiley & Son. Halliwell, B. & Gutteridge, J.M.C. (1985). Free Radicals in Biology and Medicine. Oxford: Clarendon Press. Lee, D.E. (1963). Influence of radiation on living cells (Russian translation). Moscow: Gosatomizdat. Lloyd, D.C., Purrot, R.J. & Reeder, E.J. (1980). The incidence of unstable chromosome aberrations in peripheral blood lymphocytes from unirradiated and occupationally exposed people. Mutation Research, 72, 523-532. Patterson, J.T., Brewster, W. & Winchester, A.M. (1932). 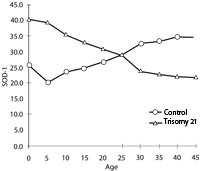 Effects produced by aging and x-raying eggs of Drosophila melanogaster. Hereditas, 23, 325-333. Richter, Ch. (1992). Reactive oxygen and DNA damage in mitochondria. Mutation Research, 275, 249-255. Shapira, A.H.V. & Cooper, J.M. (1992). Mitochondrial function in neurodegeneration and ageing, Mutation Research, 235, 133-143. Shoffner, J.M. & Wallace, D.C. (1992). Mitochondrial genetics: Principle and practice. American Journal of Human Genetics, 51, 1179-1186. Sinet, P.M., Michelson, A.M., Bazin, A., Lejeune, J. & Jerome, H. (1975). Increase in glutathione peroxidase activity in erythrocytes from trisomy 21 subjects. Biochemical and Biophysical Research Communications, 67, 910-915. Sperling, K., Pelz, J., Wegner, R.-D., Shulzke, I. & Struck, E. (1991). Frequency of trisomy 21 in Germany before and after the Chernobyl accident. Biomedicine & Pharmacother, 45, 255-262. Strigini, P., Pierluigi, M., Forni, G.L., Sansone, R., Carobbi, S., Grasso, M. & Dagna Bricarelli, F. (1990). 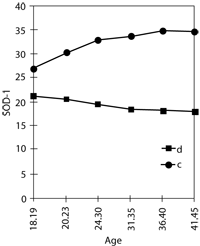 Effect of x-rays on Chromosome 21 nondisjunction. American Journal of Medical Genetics, Supplement, 7, 155-159. Uchida, I.A., Lee, C.P.V. & Byrnes, E.M. (1975). Chromosome aberrations induced in vitro by low doses of radiations: nondisjunction in lymphocytes of young adults. American Journal of Human Genetics, 27, 419-429. Uchida, I.A. (1981). Down Syndrome and Maternal Radiation. 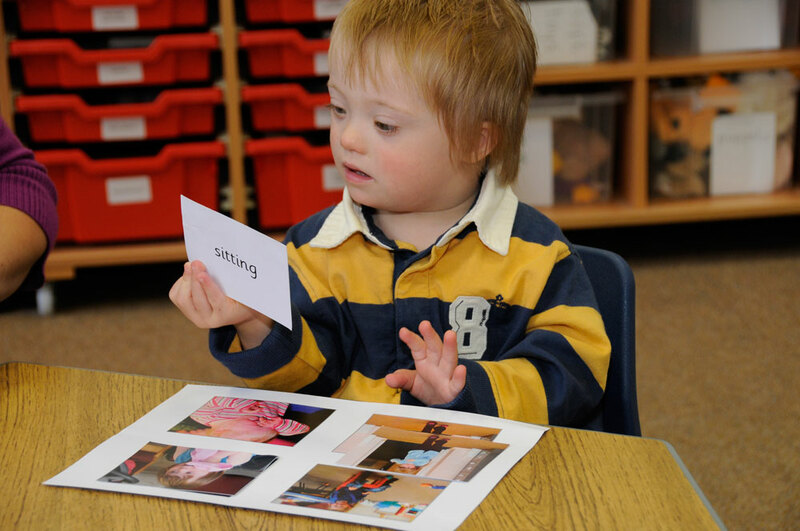 In Trisomy 21 (Down syndrome) Research Perspectives, pp. 201-223. Baltimore: University Park Press. Uchida, I.A. & Freeman, V.C.P. (1985). Trisomy 21 Down Syndrome. Parental mosaicism. Human Genetics, 70, 246-248. Uchida, I.A. & Freeman, V.C.P. (1986). Trisomy 21 Down syndrome II Structural chromosome rearrangements in the parents. Human Genetics, 72, 118-122.